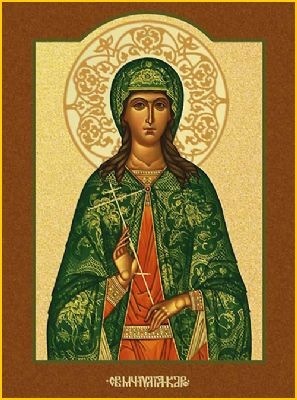 JULIA was a noble virgin of Carthage, who, when the city was token by Genseric in 439, was sold for a slave to a pagan merchant of Syria named Eusebius. Under the most mortifying employments of her station, by cheerfulness and patience she found a happiness and comfort which the world could not have afforded. All the time she was not employed in her master's business was devoted to prayer and reading books of piety. Her master, who was charmed with her fidelity and other virtues, thought proper to carry her with him on one of his voyages to Gaul. Having reached the northern part of Corsica, he cast anchor, and went on shore to join the pagans of the place in an idolatrous festival. Julia was left at some distance, because she would not be defiled by the superstitious ceremonies which she openly reviled. Felix, the governor of the island, who was a bigoted pagan, asked who this woman was who dared to insult the gods. Eusebius informed him that she was a Christian, and that all his authority over her was too weak to prevail with her to renounce her religion, but that he found her so diligent and faithful he could not part with her. The governor offered him four of his best female slaves in exchange for her. But the merchant replied, "No; all you are worth will not purchase her; for I would freely lose the most valuable thing I have in the world rather than be deprived of her." However, the governor, while Eusebius was drunk and asleep, took upon him to compel her to sacrifice to his gods. He offered to procure her liberty if she would comply. The Saint made answer that she was as free as she desired to be as long as she was allowed to serve Jesus Christ. Felix, thinking himself derided by her undaunted and resolute air, in a transport of rage caused her to be struck on the face, and the hair of her head to be torn off, and, lastly, ordered her to be hanged on a cross till she expired. Certain monks of the isle of Gorgon carried off her body; but in 763 Desiderius, King of Lombardy, removed her relics to Brescia, where her memory is celebrated with great devotion. Reflection.--St. Julia, whether free or a slave, whether in prosperity or in adversity, was equally fervent and devout. She adored all the sweet designs of Providence; and far from complaining, she never ceased to praise and thank God under all His holy appointments, making them always the means of her virtue and sanctification. God, by an admirable chain of events, raised her by her fidelity to the honor of the saints, and to the dignity of a virgin and martyr.